Industrial water supply, pressurized water using pressure vessels (autoclaves), various horticultural and agricultural irrigation applications, civil and domestic water transfer schemes. 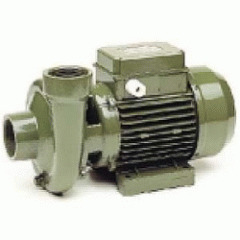 The open impeller design allows the pump to handle slightly dirty water. Pump body and motor support in cast iron. Impeller pressed brass on BP 3- 4 - 5 - 6. Impeller cast iron on CMK - BP 7 - 8. Rotor shaft fitted with seal for life bearings. Totally enclosed fan cooled motor (TEFC). Single phase motors with a built in thermal overload protection on request, the capacitor is permanently in circuit. Motor protection to IP44 (available in IP55 upon request). Winding Insulation to class F.
Standard Voltage: 230V-50Hz single phase 230V/400V - 50Hz three phase. Other voltages and frequencies available upon request. - Liquid quality required clean or slightly dirty water, chemically non aggressive. - Maximum ambient temperature 40°C. For higher temperatures please contact the sales office. Maximum working pressure 6 bar. The tolerances of the hydraulic features are according to UNI / ISO 2548-Class C, Appendix B, electric features according to C.E.I. The working features listed in the catalogue are based on continuous service for clear water with a specific weight of 1000 kg/m3. Manometric suction lift of 8 meters with a foot valve, for a suction lift of above 5 meters it is advisable to install the suction pipe with a internal diameter larger than the pump inlet.